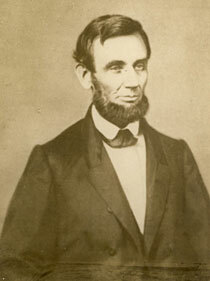 Detail of a photograph by an unknown photographer, spring 1861, believed to be the first image taken of Lincoln as president. Courtesy of the Abraham Lincoln Presidential Library and Museum. On March 4, 1861, Abraham Lincoln took the presidential oath of office. No president, before or after, entered the office with the nation in such peril. Seven Southern states rejected the results of the presidential election and formed the Confederate States of America. Four more states soon joined them. For virtually all of Lincoln’s presidency, the nation was engulfed in a brutal civil war. On inauguration day, few Americans could have predicted the depth of the conflict or its consequences.